Newcastle dug bit of a hole for themselves last night in the first 17 minutes of the game at Norwich even after going ahead with a goal from Ayoze Perez after only 23 seconds of the game. But there was then some lax defending from Newcastle and we conceded a goal after 12 minutes when Murphy scored. But then 5 minutes later it was simply a horrendous error by goalkeeper Karl Darlow. 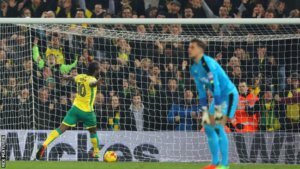 Karl completely mis-kicked the ball in what should have been a simple clearance and that allowed Cameron Jerome to tap the ball home to put the home side ahead. But after that to their credit and roared on by the away fans the players stuck together and Rafa got them steadied at half time and Newcastle came back and finally equalized on 81 minutes through captain Jamaal Lascelles to get a well deserved point. After the game Rafa was pleased with the way the side reacted to the adversity in the game and that showed a strong mental attitude which has been apparent all season. “We started really well, scored one goal and then could have scored another so it was a big shock when we went behind. At the end of the day it was a good point and certainly we didn’t want an in-form Norwich side to gain 3 points on us, which is one reason the fans were delighted when the equalizer came late in the game. But we also have to defend a lot better and that’s an area Rafa will be working on with the players this week and over the weekend in preparation for the home game against Aston Villa on Monday night. Anybody know if Ritchie was booked last night? He’s 1 booking away from a 2 match ban. If he was , he’ll miss AV and Bristol. If he wasn’t we are running the risk of losing him for one or possibly two of the big away games coming up. Why is it that some players split opinions so much? Do some people know so much while others don’t? But even footballing people get it wrong! Mitro, Shelvey, Cabaye, Bellamy, HBA, Robert, even Ginola, have all experienced this. Mitro and Shelvey are there with some illustrious company, but that’s not my intention, to prove they’re in that category. They’re young, they may well prove duds still. So, what is it? Obviously there’s talent in at least some of those players! I’m guessing people spot something they don’t like, right? *Laziness: some of the best players in history were, or appeared, lazy. Do they save their energy for the brilliant little move? Do they not have the engine? Are they really lazy? *Their worth is indeed questionable: many prefer good all round players, so if someone is only good at something, or bad at something else, he’s easy pickings. No he wasn’t booked. Only lacelles and colback. Is it a one or two game ban he will get? I get confused with the bookings tally changing after Xmas. Think you can get 10 for a one game can’t you? Might be wrong. cookie109 – pretty sure it is 2 games because on the commentary last night they were saying he was better off getting a card last night and missing Villa & Bristol rather than one or both of the big games following them. Turned into a decent point and really should’ve been three. Once again, it was individual mistakes that cost us. Turning into a bit of a theme sadly. A point will have to do. Gives us something to build on for the next two games at home. Villa not exactly setting the world on fire and ditto Bristol City. Preferably get a few goals and get the confidence high. Gayle should be better for his little cameo last night and I expect him to start v Villa. Colback – who generally pairs well with Shelvey – has struggled the last couple so I think Hayden coming back will also strengthen us. In fact, Rafa should have his strongest side for at least the Villa game, depending on yellow cards. Despite the current hype, I can’t see anybody catching us tbh. Brighton look to be getting nervous and a home draw against Ipswich won’t have helped. Next two could see us pull a bit further clear hopefully. Yeddears’ pretty much nailed the right back spot down – taken full advantage of Anita being injured imo. Villa will crumble if we score early and I expect Rafa to have the lads at full throttle on Monday night. Listening to their fans last night on the phone in it sounds like a like they’re in turmoil – which is nice. Help to push them further into a relegation battle with luck. 🙂 Agent Bruce working his magic again. Hope Jamaal’s neat volleyed equaliser gives him a confidence boost. He’s been a different guy from the up and at em fella who tried to shake up the dressing room last season. I think he’s bulked up too much for this season and he’s lost what sharpness he had before. Perhaps rather than only concerning themselves with the next match, Rafa should concentrate on only the next 45 minutes. Need to take full advantage of Villa’s nervousness on Monday night. Come out all guns blazing and get a couple of early goals. Do that and we could have a real treat on our hands. Listening to Talksport and they had a ‘huge crowd’ of 26k last night apparently. Seems they spent 76m this season, So why are we the ones always being slated as big spenders? They’re having a laugh. Looking forward to abusing Stephanie Bruce on Monday, we gave him absolute pelters at Hull. I don’t know what it is about Norwich but we always seem to have some cracking games against them. Like most I only listened to the radio commentary and watched the highlights but it seemed to be a good game. I’m not having a pop at those who voted but I couldn’t choose a MotM from what I heard. Watching those extended highlights we have to be confident after that attacking second half display. Creating chance after chance.. Right up to Shelvey’s last minute free kick pinging around the six yard box like pinball. Can’t wait to get into St James’ on Monday night – we’re gonna batter the Villa bus!! Hope the lads don’t get over confident for Villa as they always play well against us. We need to be sharpnin out play and not cocky. If we do that it will be another 3 points in the bag.